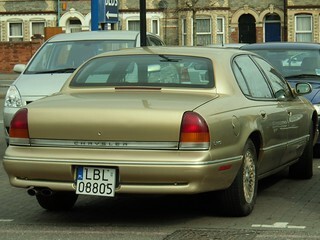 1993-97 Chrysler LHS 3.5 V6 Saloon. Two foreign plated Chryslers in a matter of a few days, slighty unusual, and both cars which were similar to one another. The LHS was the flagship model of the Chrysler model range at the time it was made, certainly does look rather luxurious! Again, my knowledge is rather lacking on these cars, this being the first one I have ever seen, and by far and away the 'poshest' Polish registered car I have seen in the UK. I seem to be seeing more cars from new EU countries by the day now.